Abcom’s new eProphet.NET Labour & Scheduling package is proving extremely popular with Quick Service Restaurant (QSR), Café and Licensed Restaurant owners. When combined with our highly successful LabourGuard Timeclock system, our clients are experiencing reductions in labour and food costs. 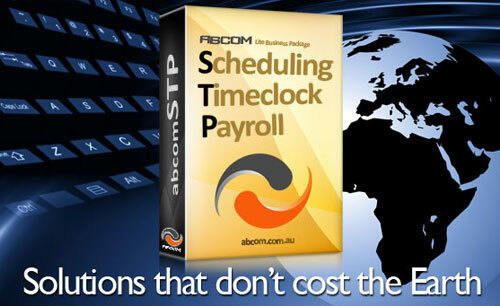 Abcom’s eProphet.NET Schedule Preparation system is fully costed based on your award or payroll details. Rosters can be prepared efficiently, free of errors and schedule conflicts and have your “aces in their places”. With easy-to-read formats for Staff and Management, systems like our staff scheduling products are used in every McDonald’s Restaurant in Australia. Our Scheduling system is powerful and adaptable even for a handful of employees and reliable and robust to handle hundreds of employees. Detailed projected costing analysis allows our clients to control their labour costs and avoid costly overruns through lack of initial planning. When teamed with our LabourGuard system, real time comparisons of labour costs are quickly available so that action can be taken. Actual hours worked are compared to scheduled hours in real time. With our “intelligent Time Clocks” you can be assured that Award rules are correctly applied to keep you compliant and ensure your Employees are paid correctly. In addition eProphet.NET Scheduling tracks and manages your training needs. Easy to use, our Scheduling products record employee skill levels. Manage the balance of skills and competency of your employees on a shift-to-shift basis. Understand your training needs, plan for the future and be in full control of your Business. Our eProphet.NET Inventory system enables our clients to see the impact of raw item price rises on their bottom line instantly. This empowers the Business owner to make real time decisions on menu pricing and structure. Our comprehensive Recipe Item system has been proven over the past eight years with some of the largest QSR Restaurants in the world. Our Electronic Data Collection (E.D.C) system provides our clients with the information they require when they require it. Key Performance Indicators (K.P.I’s) can be provided to our customers to their specifications, not ours. Trackside Restaurant in West Gosford NSW recently upgraded to our latest BOS system in August 2011. Trackside is also utilising our LabourGuard Intelligent Time Clock System to assist in the reduction of overtime payments. LabourGuard uploads employee clockings directly into Trackside’s payroll system also supplied by Abcom. This seamless transition of employee’s time clockings direct into the Payroll system saves the Payroll Administrator a considerable amount of time otherwise taken to manually key in each employee’s time clockings.